Everyone’s idea of the ultimate golf getaway to Myrtle Beach is different. Maybe you are looking for four-star accommodations with lots of amenities that are located right on the golf course or oceanfront. Perhaps you are traveling on a budget and want to get the most bang for your buck. Some prefer to stay right on the ocean, so that the non-golfers in the group have plenty of recreational options. Others want to stay close to all of the shopping, entertainment and attractions that make a Myrtle Beach vacation so popular. And of course, everyone planning a Myrtle Beach golf trip wants convenient tee times on the area’s most popular golf courses. How do you combine all of these ingredients to create the Myrtle Beach golf getaway that is perfect for you? The golfing packages offered by the Myrtle Beach Golf Authority (our sister golf package company) combine courses and accommodations that are specifically tailored to meet your golf group’s specific needs. These packages offer deluxe packages that allow you to play at some of the area’s most prestigious golf courses while staying at fabulous Elliott Beach Rentals vacation properties that are conveniently located near all the golfing and entertainment in the Myrtle Beach area. If you are traveling with a large group, you can choose from many affordable packages that offer you plenty of golf while staying all together at spacious Myrtle Beach vacation homes. You can also choose from packages that include lodging at wonderful Myrtle Beach vacation rentals, free lunches at the clubhouse, free drinks on the course, reward cards that can be spent on the course or in the clubhouse and many other specials and discounts. Another way to create a wonderful golf experience for you and your group is to choose where you want to play first and then decide on a Myrtle Beach vacation rental in the vicinity that meets your needs. Barefoot Resort offers four marvelous courses created by top designers that each offer different challenges among gorgeous scenic beauty. The popular Legends courses are Legends Moorland, one of the most challenging courses in the area, Legends Heathland, which echoes the style of old courses such as St. Andrews, and Legends Parkland, which has been named by Zagat’s as one of country’s top courses. 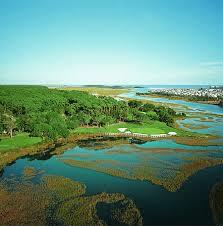 Tidewater Golf Plantation is another fabulous course that is situated between the Intracoastal Waterway in the Cherry Grove section of North Myrtle Beach, SC and has glorious views from all of its 18 holes. All of these Myrtle Beach golf courses offer customized golf packages, special 48 hour rates and are just minutes away from all of the exciting attractions and amusements that will keep you entertained during those post-golfing hours. Decide which courses to play, investigate their packages and specials, and then choose from the huge selection of properties through one of the Elliott Beach Rentals and you have all of the ingredients for an unforgettable Myrtle Beach golf getaway! Everyone’s idea of the ultimate golf getaway to Myrtle Beach is different.